The finals of the Small Firms Association will take place next month, on March 4, taking place in the RDS with DB Sports Tours named as a finalist. The Small Firms Association (SFA) is the ‘national organisation exclusively representing the needs of small enterprises (i.e. those employing less than 50 employees) in Ireland’. The SFA is ‘funded directly through subscription fees from its 8,000 member companies’. 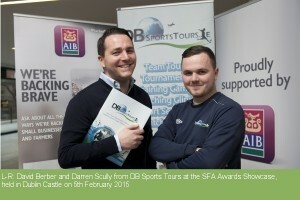 DB Sports Tours have been named in the final list for the outstanding small business award. DB Sports Tours will be up against five other companies for the award: Earth’s Edge, Italian Tile and Stone, Kevin Egan Cars, National Vibration Monitoring, and Trackday Performance. The judging panel consists of eight different figures, which can be viewed here. Last month DB Sports Tours took part in a Showcase event in Dublin Castle; co-founder David Berber said “were thrilled that all our hard work is getting recognized.” For more information keep an eye on the blog here.